The weekend is when most people come through the house, so we’ve got it in ship-shape (assuming that the ship is tidy and has clean floors). So for breakfast this morning I gave out the muffins I made a couple days ago. After I sent the girls outside with their breakfast muffins, I thought they would wander around, but I found them all sitting nicely at the outdoor setting. The girls always think “cupcakes” are such a treat. Maybe I’ll set this up as a regular Saturday morning breakfast tradition. 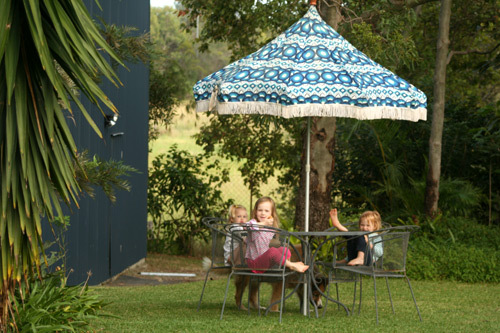 What a pretty umbrella….what a pleasant garden.Do not take your clear blue skies and sunshine for granted! Calista calls this umbrella “blueberries”.